These all new GBC Designer World Map Poly Report and Presentation Covers are the perfect professional image enhancer you and your company need to put your best foot forward. These letter size, frosted translucent poly covers are perfect for whatever presentation, report, or portfolio you need to put together. Crisp, square corners give you a slick professional edge, while the navy world map gives a recognizable image. Designed to enhance presentations as well as protecting your documents, these recyclable professional poly designer covers offer you the best of protection and professionalism. Shop today with MyBinding.com and save! Nice, professional, heavy-duty covers. Great price / value. Nice and sturdy with a cute design. I use these for homeschool and my son loves them. These were offered an a great price. It's nice the mybinding offers items that smaller companies or companies with a small budget can try to give their presentations a little something extra. Thanks Much! World Map Polycovers Review by Michael J. 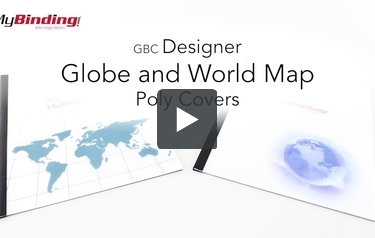 This is GBC Designer Globe and World Map Poly Covers! They are clear plastic covers that have different styles of our planet on them. and they come in a thickness of 14 pt, which is on the thinner side of the paper thickness spectrum. Of course, when using your covers, make sure the orientation of the continents are correct—otherwise you might not look as professional. These are frosted covers—they’re clear, but not perfectly clear. And you can punch any hole pattern on them using your personal binding machines for a professionally bound book.